With a personal fortune estimated at 110 billion dollars in 2017, Jeff Bezos is, at the age of 54, the world’s richest man. And that sum should increase markedly between now and the end of the year, as this summer the company he founded crossed the trillion dollar market capitalization mark. In under a quarter of a century the New Mexico native has transformed Amazon from a struggling online bookseller into a global mega company, which dominates the e-commerce, data storage and intelligent personal assistant sectors and has designs on many others. Like many American success stories, this one starts out in the garage of a modest suburban home. In 1994, armed with a 300,000 dollar bank loan, he founded the first-ever online bookstore. He had just turned 30 and had next to no entrepreneurial experience. The Princeton graduate and former Wall Street manager struggled at first to convince investors of the potential of his company, as Amazon posted losses in its early years, but gradually it began to win market share from established booksellers such as Barnes & Noble and in 1997 launched its IPO. With Amazon expanding at the turn of the century, Bezos began investing here, there and everywhere in an effort to disrupt existing business models. He offered lower prices on products such as books, CDs and DVDs, favoring growth over profit, always proceeding in a methodical and well thought out manner. In the digital era, he was the first to understand the importance of quickly reaching critical mass. A decade on from founding Amazon, he had solidified his reputation as a businessman and investors who had been reticent were won over. 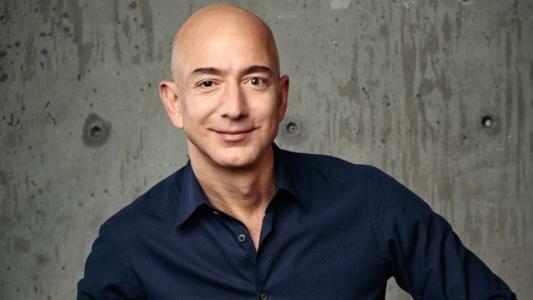 In the business world, Jeff Bezos is often compared to a steamroller. Every company dreads the day he takes a shine to their sector of activity. Just ask Walmart. In June 2017 Amazon got into bricks and mortar retail with the 13.7 billion dollar acquisition of Whole Foods, in one fell swoop gaining 400 physical points of sale. Bezos aims to revolutionize the experience of shopping with Amazon Go, a range of convenience stores without checkouts where items are scanned as you put them in your shopping basket and the cost of the purchases deducted automatically from your Amazon account as you exit the store. Bezos aims to open 3,000 Amazon Go stores in the US by 2021. Although at present Amazon accounts for only 2% of grocery store sales, its unrivalled ability to innovate has the traditional retailers running scared. Bezos has announced that very soon you will be able to eat what you buy at Amazon Go, inside the stores themselves ‒ a development that will see Amazon compete directly with chains such as Subway. A science-fiction fanatic ‒ he single-handedly saved sci-fi show The Expanse from cancellation this summer by bringing it to Amazon Studios ‒ Bezos has already invested billions on the conquest of space. Blue Origin, the company he founded in 2000, is developing a vessel and lunar lander capable of making regular cargo deliveries to the moon, with the eventual goal of establishing a permanent lunar colony. “We have to go to space to save the Earth…and we kind of have to hurry,” he has said of the program. Much of the money he makes from Amazon is reinvested in Blue Origin. He puts in a billion dollars a year and an increasing share of his time. He spends every Wednesday at Blue Origin’s headquarters in the suburbs of Seattle, a company he aims to see double in size by 2021, by which time both its commercial and space tourism services should be up and running. And with space flight tickets priced at 300,000 dollars each, Blue Origin will soon begin to claw back some of the money pumped into it. Jeff Bezos may have his sights set on the stars, but his feet remain firmly on the ground.